Pupils downed pens and pencils to stage "strikes" at several schools in Argyll and Bute over a plan to cut services for young people. Argyll and Bute Council, which is due to set its budget on Thursday, said it was facing "tough choices". One option for councillors would see a significant reduction in spending on youth services. Pupil protests at several local secondary schools went ahead on Wednesday. Some young people fear the reduction in spending on youth services will lead to a big reduction in activities such as youth forums, summer camps and community events. 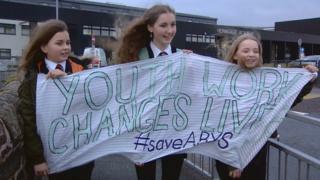 The protests were organised by Rosie Sumsion, member of the Scottish youth parliament for Helensburgh and Lomond. She said those taking part wanted to send a strong message to the council that youth services matter. She told the BBC: "It's not just about what we do now but about the future implications of our actions. "Because youth work impacts nearly every element of education, often it's hard to tell what they are actually doing so it means sometimes it is easier for them to be put to the side. Generally it feels like a harsh cut for us." She is concerned about the long-term impact of cuts. She said: "It's not just about the opportunities it'll stop me having - I won't be able to be an MSYP with the same support I have now. "It's about the opportunities future generations are not going to get. By cutting youth services it's saying they don't care about these opportunities." First year pupil Carla, 12, felt disappointed at the proposal. She said: "We want to stop youth services and youth forum being cut. I have been in this for a year and a half now. We do the summer programme and it helps us through rough times." Fellow S1 pupil Samantha added; "It's a fun time to get away from your house. I just don't want them to cut it." "Strikes" were planned for fifteen minutes after break time on Wednesday morning at six schools: Hermitage Academy in Helensburgh, Oban High, Campbeltown Grammar, Lochgilphead High, Tarbert Academy and Dunoon Grammar. Last week thousands of school pupils across the UK took part in similar protests over climate change. Argyll and Bute Council said decisions would be taken by councillors at its budget meeting on Thursday. A spokeswoman said: "Years of funding cuts mean we must focus on what we, as a council, have a statutory duty to deliver. "Sadly, we have to reduce, or in some cases even stop, some of the other valued services that we provide. "There are tough decisions to be made on savings at our budget setting on Thursday as we work to deliver a balanced budget and provide sustainable services to our communities."